Life with a toddler is filled with giggles & glee in one moment and tantrums & tears in the next. Seeing the world from their viewpoint may give you a better understanding of why they meltdown and help you think about ways to prevent tantrums. In this post, I also share tips for ways to manage the inevitable tantrums when they come. Why do toddlers have meltdowns? 1. Rules: They want to do something that’s not allowed, and are angry that you’re blocking them. 2. Impossibilities: They want something that’s not possible, and can’t understand when you explain. 3. Lack of control, lack of choices about where they go and what they do. 4. Frustration: They want to be able to do something, but they’re not yet capable of it. 5. Can’t communicate: They want something but don’t have the words to tell you what it is. 6. Separation and/or unfamiliar situations: Being away from familiar supports is hard. 7. Fears: The world can be a scary place when you’re small and don’t understand much! On a good day, when your child is rested and you’re calm, they may be able to handle any of these things. But when they’re tired, hungry, sick, cold, hot, or overstimulated, even little upsets become overwhelming. Or if you’re tired, hungry, or stressed, you may not notice early cues and they may end up in a meltdown. Meet physical needs: Your child is less likely to melt down if he is rested, fed, and comfortable. Be aware of your child’s capacity for stimulation: Children all have a different threshold where they overload. Some children are particularly sensitive to noise, others to bright lights, others to crowds. When planning your child’s activities, think about how much they can manage at a time. Set limits and follow them consistently: We don’t always give children what they want, and we don’t want them to think they’re the boss of the family. When you set limits, you will face the occasional tantrum, but over time – with consistent enforcement, the child learns and respects the family limits, and will have fewer meltdowns than the child who never knows if or when a rule will be enforced. Watch for early cues: Notice when your child is reaching the end of her rope. Let her know that you’ve noticed – that helps her learn to recognize it for herself. Try distraction or a change of scenery. Talk about meltdowns when they’re NOT having one. Ask your child to let you know when they have one coming on. (Note: it will be a while before they’re capable of that!) Praise your child when they’ve done a good job of calming themselves down – we want to reinforce their efforts at self-regulation. Talk about and model, positive ways to manage feelings. Use Emotion Coaching to build emotional IQ. Researchers developed a “onesie” that parents in the study put on a toddler that would record for several hours, and possibly catch a meltdown. Then they analyzed the pattern of the tantrums. Sad sounds – whimpering and crying – are heard throughout the tantrum; and mixed in were peaks of yelling and screaming – angry sounds. Children tend to build up to a peak of anger quite quickly, then do something physical (throw things, throw themselves on the floor, hit), and then they collapse into sadness. If parents asked a lot of questions, or tried to verbally reason with the child, it would prolong the tantrum. When a toddler is very angry, he can’t process language, and asking questions just pushes him into overload. 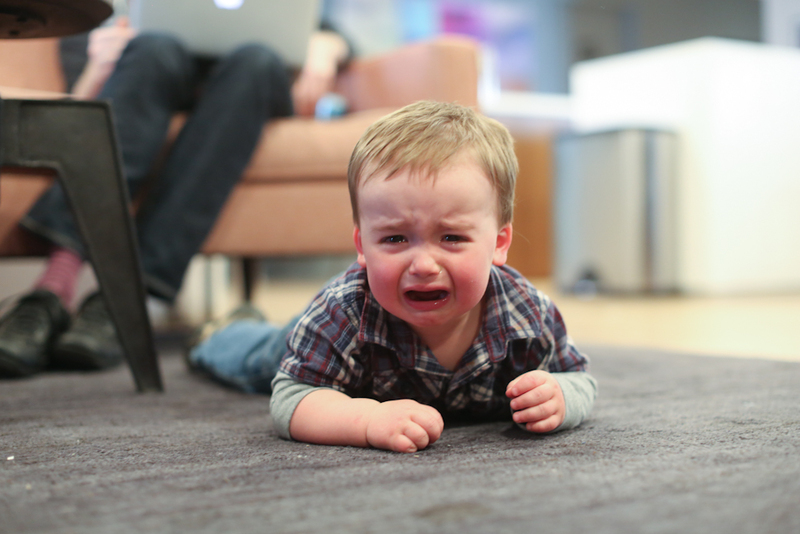 Researchers felt the research-based trick to end a tantrum is to get past the anger. Either ignore the child, or respond with as few words as possible. When the child has released anger, what’s left is sadness, and they will seek comfort. Don’t “over-respond”. Keep your response calm and low key. You don’t want to pay too much attention to the tantrum as you don’t want to reward the behavior. Stay calm. A tantruming child is often overwhelmed by the strength of his own emotions, and needs you to model emotional stability to help re-ground him. Don’t ask questions or try to talk the child down with a lot of words. If you need to talk to change your child’s behavior, or move her to a safer / more appropriate place, give very simple commands. Stay close by. Don’t hover or crowd, as this may provoke more anger – he may yell at you to ‘go away’. But, staying nearby helps the child feel safer and tells him you’re there when he’s ready for comfort. Don’t let your child hurt herself, or anyone else. Keep her from damaging possessions. At times, you may need to physically restrain her to keep things safe – it’s OK to firmly hold an upset child in a gentle and supportive way. Sometimes she will resist the hold for a bit, then shift from anger to sadness in your arms. Once the tantrum blows over, calm and comfort. Name and validate the emotions they were feeling. Tantrums often frighten a child, who can be scared by how out of control they felt, so they may need help calming their fear. Sometimes your child will calm down, but you will still be full of tension and stress from the experience! Think about self-care methods that help you release that tension and move on – a few deep breaths, a drink of water, taking a short break… Get support from other parents. For older children (3 – 5 years), talk about the tantrum later that day when everyone is calm. Validate the emotions they were feeling at the time, but also discuss other ways they could have managed those emotions. Develop plans for how to handle similar situations in the future. If you found this article helpful, click on the links on the right to “follow this blog” and you’ll get email updates when I post new articles, or “like me on Facebook” to stay up-to-date on posts. This entry was posted in Child Development, Discipline, Emotional / Social and tagged Anger, discipline, Emotion, meltdown, preschool, Tantrum, toddler on November 14, 2013 by Janelle Durham.